Note: This Model Airplane is an extra stock from our bulk orders and production is still on-going. This awesome and exquisitely crafted Israel Aircraft Industries IAI Eitan UAV (BIG) Wood Model Airplane is finely hand-carved from kiln-dried Philippine Mahogany and skillfully hand-painted in detail by gifted artisans of eModelAirplanes. Length: 8 inches Wingspan: 16 inches. Model weighing 1.76 pounds(0.80 kgs), and a package weight of about 5.50 pounds (2.50 kgs). Comes with a Detachable Wooden Stand. FRESH from the factory and our craftsmen, NOT Mass-Produced, Individually Handcrafted & Handpainted (no decals), Well-Packed in strong Carton Box with Polyurethane blue Foam and Plastic Protectors, and No Reserve! Be sure to add me to your favorites list! Our factory makes all kinds of wooden models with different sizes, scales, designs and paint schemes. Our experts can make ANY & ALL kinds of Airplanes, Ships, Blimps, Submarines, Seals, Plaques, Spacecraft, Rockets, Missiles, Bombs, Science Fiction, Sci-Fi and futuristic/fictional models in your color and detail specs. We specialize in CUSTOM-MADE models! We stock more than 1,200 models and because of our fast-moving inventory, stock availability varies day-to-day but since we make them ourselves, we guaranty availability within 4-6 weeks. Islandinternetinc- ahs 9-09-08, 1-29-09 pics. We are a proud member of PALMS (Philippine Association of Licensed Modelers & Sellers). We truly believe in our craftsmen's quality, thus we GUARANTEE 100% of all products that we make & sell. 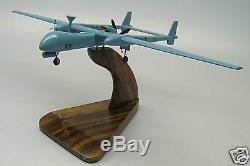 The item "Eitan Israel Aircraft Reconnaissance UAV Airplane Desktop Wood Model Big New" is in sale since Tuesday, December 30, 2014. This item is in the category "Collectibles\Transportation\Aviation\Military Aircraft\Desk & Shelf Models". The seller is "emodelairplanes" and is located in Metro Manila. This item can be shipped worldwide.